In Civilization, you can play as George Washington as he slowly transforms the American empire from its nomadic hunter-gatherer roots. In SimCity, you can be both the mayor and the city planner at once, zoning neighborhoods and delivering utilities to a faceless populace. But both titles forget the true hero of our industrialized society: the lowly construction worker. 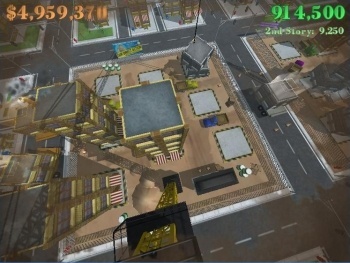 Crane Wars, the latest free title from AAA browser game developer Flashbang LLC, puts you in the shoes of an everyday blue-collar union man who must assemble skyscrapers the old-fashioned way: by picking up one floor at a time and meticulously stacking them atop one another. Unfortunately, the scabs at the site next door aren't just willing to do the work at half the price - they also use their crane to toss cars and trucks at your structures. All the while, a timer in the form of a plummeting budget counter lets you know how much money you have left before your operation goes broke. Racking up a high score is a matter of carefully (but swiftly) putting together the tallest structures you can while avoiding the assault from your capitalist enemies. As with previous Alt+Escape picks Paper Moon and Blush, Crane Wars requires you to download the Unity plug-in before you can play, but it's well worth it. And the next time you summon an earthquake to ravage your SimCity creation, think about the hard work that went into every block of your virtual borough, and you just might reconsider.